Facebook has been under fire from the mainstream media for about a year, but its brand-safety and privacy scandals havenâ€™t deterred advertisers. In its recent Q4 earnings report, the social giant reported its North American average ad revenues per user (AARPU) were up nearly 30%, and more advertisers than ever are buying. AARPU has grown rapidly even as usage of ad-supported Facebook properties has stagnated. That could be due to higher ad loads or higher prices for the same ads; Facebook executives talked up improved targeting capabilities on its earnings call. It could also be due to significant contributions from Facebook Audience Network adsâ€”off-property placements that make up an unknown share of Facebook's ad revenues. Whatever the reason, the upshot is that advertisers end up paying more for the average Facebook userâ€™s attention. We estimate that the average US adult spent just 6.5% of their daily digital media time with Facebook in 2018. Looking more narrowly at nonvoice mobile activity, Facebook accounted for less than 9% of daily time. 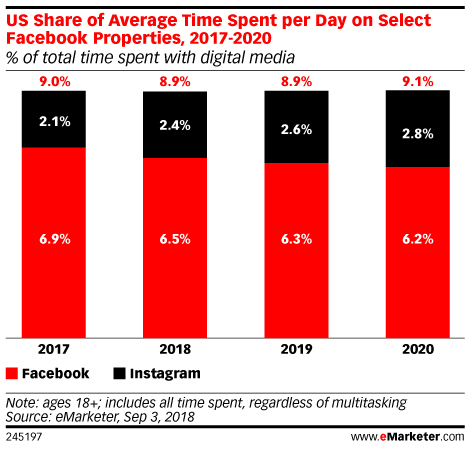 We donâ€™t break out Instagram usage time by device, but we estimate that the average adult spent an additional 2.4% of daily digital media time on Instagram last year, for a total of less than 9% of digital media time on Facebookâ€™s ad-supported properties. In other words, Facebook's share of digital ad revenues far exceeds its share of digital media time. With AARPU growing as absolute time spent with Facebook in the US stagnates, the gap is expanding. So the cost is higher for the average Facebook userâ€™s attentionâ€”at least on mobile devices, where Facebook makes the majority of its ad revenues. 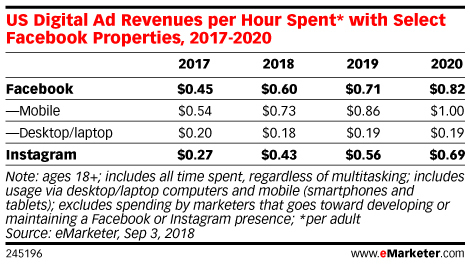 For each hour that a US adult spent on Facebook on mobile last year, advertising revenue was $0.73â€”about 35% more than the prior year. Despite usage trends, Facebook's status as a place internet users spend a lot of time has cemented its place in many budgets. That was one of the main factors noted in an AdExchanger article that asked last week, â€œWhat would the media plan look like without Facebook?â€� The other factâ€”Facebookâ€™s relative brand-safety compared with the open programmatic exchangesâ€”could also stand more scrutiny. Itâ€™s difficult to compare the brand-appropriateness of content across the long tail of programmatic to that on Facebookâ€”but Facebook is largely made up of user-generated content, and broad swaths of it (think partisan political rants and posts about personal tragedy) are undesirable from an advertising adjacency perspective. What is more comparable is their vulnerability to fraud. While fraud detection rates in the open markets vary, firms like Integral Ad Science and Pixalate ballpark invalid traffic in those exchanges at around 15% to 20%. Facebook, which made headlines last year for deactivating more than a billion duplicate or fake accounts, reported that the core property had 2.32 billion users worldwide as of December 2018. We estimate the unduplicated global audience is about 30% lower, at 1.64 billion users. Copyright 2019 eMarketer inc. All rights reserved. From https://www.emarketer.com. By Nicole Perrin.